UXBRIDGE, Canada, Nov 1 2011 (IPS) - Mountains of hazardous waste grow by about 40 million tons every year. This waste, mostly from Europe and North America, is burned in developing countries like Ghana in a hazardous effort to recover valuable metals. Few studies exist, but anecdotal reports show that a substantial portion of shipments to Africa of electronics supposedly for reuse is in fact trash, said Ruediger Kuehr, executive secretary of the Solving the E-waste Problem (StEP-Initiative). StEP is a consortium of NGOs, industry groups and governments headquartered in Hamburg, Germany. A Ghanian government study this year reported that in 2009, the country imported some 215,000 tons of electronics, of which 70 percent were labelled as usable. Of those, at least 15 percent were actually trash, the study found. Many of the usable products become e-waste relatively quickly, due to their shorter lifespan relative to new goods, and must be disposed of, he said. Ghana, like many African countries, doesn’t have the capacity to properly handle e-waste. In fact, throughout the world, only five facilities exist that can safely complete end-of-life e-waste processing. Such facilities cost billions of dollars and don’t yet make a profit on the valuable metals they recover. There is gold to be found, literally, in e-waste. If all the metals were recovered from 100,000 cell phones, there would be an estimated 2.4 kilograms of gold, more than 900 kilograms of copper, 25 kilograms of silver and more. That’s about 250,000 dollars worth of metals. NiMH rechargeable batteries, for instance, contain valuable and recoverable cobalt, nickel and rare earth elements. 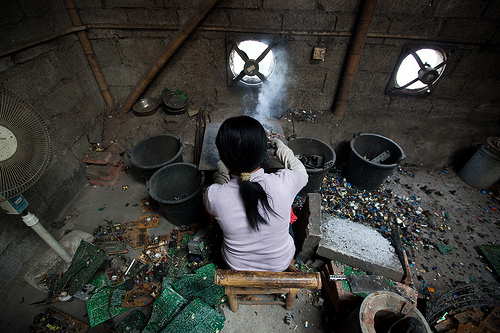 Informal recycling not only poses serious health and long-term environmental risks, but many rare and critical metals and elements are also lost. Rare metals like coltan and indium are highly valuable, but they can only be recovered with advanced recycling technology. The ongoing loss of these and others will drive up the cost of products, ranging from flat-screen TVs and mobile phones to electric cars and wind turbines, Kueher said. He acknowledged that having one or two complete end-of-life recycling facilities in Africa would be better, but the cost would be extremely high. African governments have become acutely aware of the e-waste issue and its potential impact on human and environmental health. Many countries are enacting regulations and increasing inspections, Kueher said. Preventing the loss of the valuable elements in e-waste through efficient recycling and better product design comprised the training program of the 2011 StEP E-waste Summer School, where Sampson’s research was first presented. “The public is still largely unaware of the e-waste impacts on human health and environment and discards many devices inappropriately,” said Kueher. Ideally, consumers would buy not a product but a service, like mobile phone service or computing services, he said. Companies would own the phone or computer that provide those services and then be responsible for disposal and recycling. While this approach is not uncommon in the business-to-business sector, there is no research on whether people are willing to give up ownership of physical phones, computers or other devices. Governments can do more to help close the loop, so that components and materials are reused and not wasted. Further intervention in the form of regulations, standards or product labelling schemes are essential, Kueher concluded.